The Pop-Up Paper House is a wonderful craft project and toy which will offer hours of enjoyment for children and adults alike. Build it, play with it, then fold it away for storage or travel! Though made entirely of paper the rooms with their furniture are strong enough for real play. This video shows the house under all angles, and gives a quick introduction to its features and assembly. Watch 9 year old Alvin make the pop-up staircase and 5 year old Lily sing to herself as she plays with it. Most doll houses are space hogs, dust magnets and insanely expensive to boot. Not this one! Knock it down and fold it up for storage or travel. The pop-up paper house kit comes with everything you need to make this two story, eight room, and incredibly detailed foldable house. Kit includes seventeen templates, cut, scored and ready to fold and assemble into eight pop-up rooms complete with all the furniture and accessories. The rooms open and close as easily as a book. Features a closet, which opens to reveal hanging clothes, mirrors in the bathroom and over the baby’s crib, a Steinway grand piano, and artwork throughout the house. 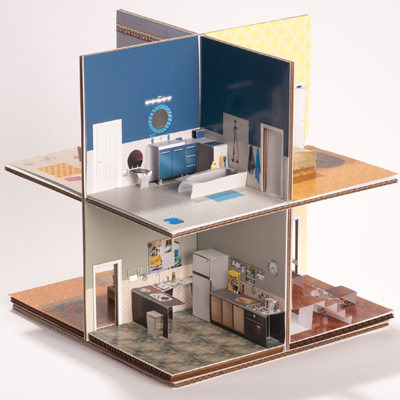 The kit also includes a lightweight but sturdy corrugated cardboard house structure which is printed with matching graphics, die-cut and ready to assemble without any additional tools or hardware. Put it together like a simple 3D puzzle, and pull it apart when you’re ready to store your pop-up house flat. 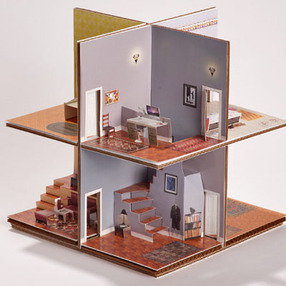 Each room is made of two interlocking pop-up cards, so it is much more sturdy than you’d expect from a paper toy. This house is not just for display, it is designed for play. Please contact us within 14 days after receiving the item for refunds and exchange. Item returned must be in original packaging and cannot be partially or fully assembled. Please note shipping cost is for one item. If you wish to order more tan one I will give you a quote for your shipping cost.